The Santa Clara River Valley Railroad Historical Society purchased the reefer car thru the generous donations of the Fruit Growers Supply of Santa Paula California and Sunkist Growers. What makes this so appropriate is that the PFE cars were such a vital part of the Santa Clara Valley's history for so much of the 1900s. 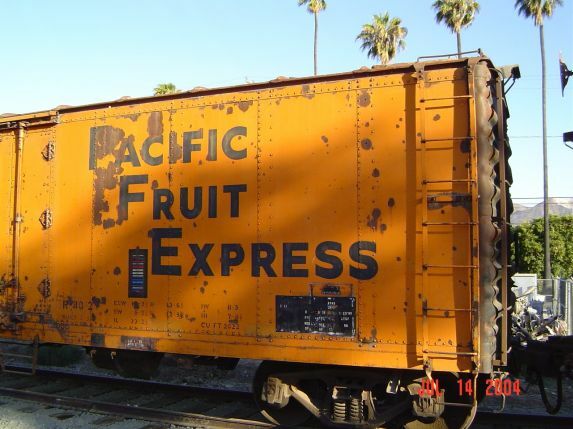 One can still see today where the various fruit packinghouses, from Ventura to Piru, had loading docks for PFE cars, where the valleys fruit was sent to destinations around the nation. The Santa Clara River Valley Railroad Historical Society PFE car (Pacific Fruit Express) # 11403 was built by the Pacific Fruit Express Company of Colton, California in May of 1957. The model is called a R-40-27 steel reefer. 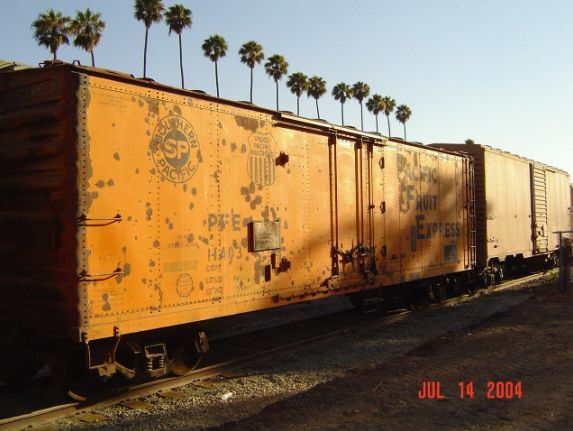 The car was originally owned by the joint venture of the Union Pacific and the Southern Pacific railroads, which was called Pacific Fruit Express. Both companies' emblems are displayed on the car. This car was among the last of the refrigerated cars made that used ice and salt to cool their cargo. In 1978, the joint venture between the U P and the S P ended. The #11403, since it has both the SP and UP emblems still on the outside, shows this car was not repainted after the 1978 asset split. The car had several problems associated with its continued usefulness to the railroads after 1978. The method of cooling the car, which was by ice, was quickly coming to an end, and the temperature regulated mechanical reefers were replacing them. The trucks or wheel sets on the car were friction trucks, and were being replaced by cars with non-friction or 'roller' bearings. Although the car could have had its trucks replaced with the non-friction bearing type, one other problem probably dealt the deathblow to its service usefulness. This is when the swing out doors used on the car were outlawed. 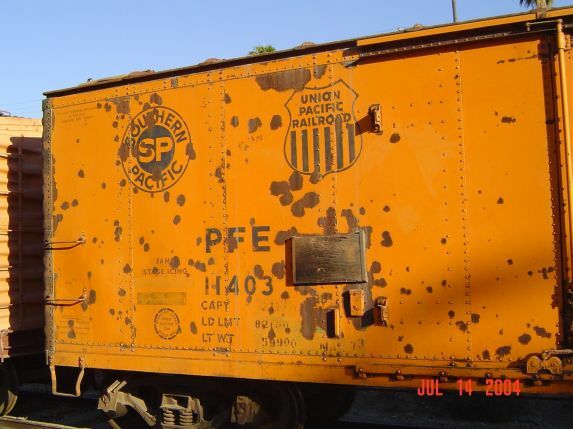 The doors that were now acceptable for boxcars were the type of doors that slid on tracks from side to side flush with the car. Even though there is a bit of a gap in the history of the car after 1978, Stan Garner, one of the previous owners, has been gracious enough to provide the following history on the car. L. S. Garner purchased the car from Phil Monte during June 1996. Ownership was later transferred to The Train Source, Inc. on August 7, 1997. Finally it was then sold to the Santa Clara River Valley Railroad Historical Society on January 16, 1998. Stan Garner writes, "Phil Monte told me, that when the car was retired from reefer service, the ice bunkers were removed and planked over, so the car could be used to ship dry dog food. I suspect that it was removed from service when the swing open side doors were outlawed. I'm not sure when that happened." The car is currently stored in the Poll Creek Yard of the Fillmore & Western Railway awaiting refurbishment to its original condition. It is hoped to locate two original ice bunkers to reinstall in the car. The PFE is one of three pieces of railroad rolling stock owned by the Society. The others are a Pullman Union Pacific sleeping car and a Santa Fe cupola caboose.